While it has been over four decades since the death of Dr. Martin Luther King Jr., his message and views remain critically relevant today. With the recent unveiling of his monument in Washington D.C., I thought it fitting to reflect on his teachings and consider the implications for leadership in today’s context. Lately, the buzz surrounding the new monument has focused on the controversy over its look and the paraphrasing of King’s words. The purpose of the tribute, however, is mainly honor; a reflection on King’s significance to our society and, ultimately, educating those who did not experience him directly. 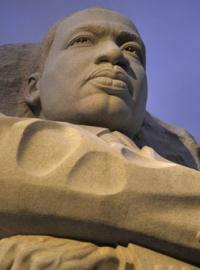 King’s message speaks of peace, love, justice, righteousness, accountability, and humility. His message was revolutionary and zeroed in on issues that we—as a nation and as human beings—needed to make real progress on. Despite King’s influence, significant challenges, complexities, and contradictions remain in our everyday world indicating that we are still short of Dr. King’s dream. Supporter and long time friend of Martin Luther King, poet Maya Angelou, has publically stated her belief that this quote is an inadequate representation of King and of his message. The architect for the memorial, according to several news sources, has responded by refusing to change the inscription to reflect Dr. King’s actual words claiming that there is not enough room on the monument for the exact quote. We can certainly choose to focus on the positive and embrace the success of creating the memorial; however, it is a bit disturbing to think that we might have rewritten history and misrepresented an essential point. How can a monument that represents a man who said so many profound things contain a paraphrased statement that changes his intended meaning? How did it come to be that the paraphrasing of an architect who set out to honor King misrepresent King’s legacy? It may be a minor point in the grand scheme of the memorial, but is it not an important one? The paraphrasing of King’s quote miscontrues the message he gives future generations. King’s message, after all, wasn’t intended from the “I” perspective—that heroic, traditional leadership role. King’s teaching concerned shared or relational leadership and the empowerment that grows from it. From this perspective, Dr. King’s leadership and his message of peace, love, justice, righteousness, accountability, and humility reminds us that voice matters; relationships matter; accountability matters; interdependence matters; and system dynamics matters. Modifying his words modifies his true message. How can we rethink our leadership roles using Dr. King’s message? How might we as leaders create environments where voice and relationships matter? How can we invite more accountability and illuminate the interdependence and systemic nature of our existence? How might King’s message of 50 years ago enable us to lead more successful social change efforts today? Let’s use the quote controversy to focus, once again, on Dr. King’s fundamental message and help generate greater appreciation for and attention to our relationships. This thinking will serve as a means for advancing the change we want to see in the world.